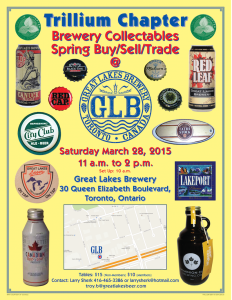 Trillium Chapter: Brewery Collectables Buy/Sell/Trade show at Great Lakes Brewery on March 28th. Booths with brewery items can include labels, coasters, tap handles, growlers, posters, signage, bottles, cans, trays and more. Come out and see Canadian brewing history in person. Have any interesting old brewery items? Bring them out on the 28th for collectors to see and possibly buy/trade with you. Jordan St. John, author of “The Lost Breweries of Toronto”, will be on-site selling and signing copies of his fascinating look at Toronto’s rich & storied brewing past. 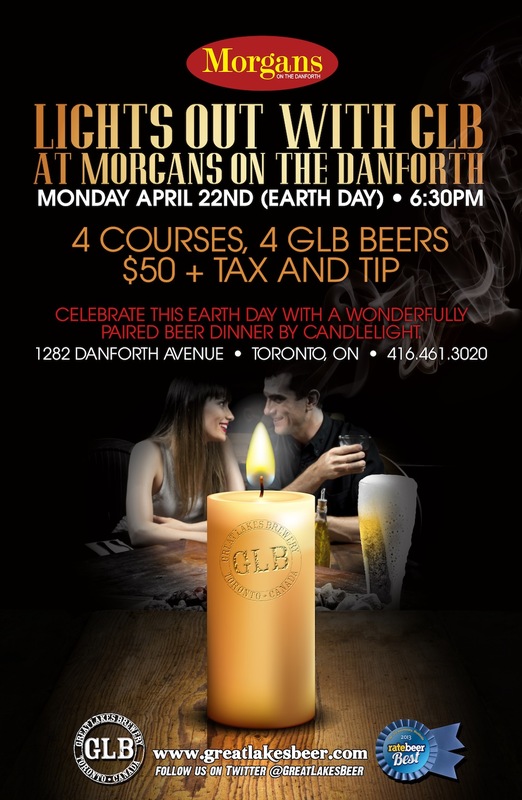 Morgans/Great Lakes Brewery Earth Day Beer Dinner! Come celebrate Earth Day with Great Lakes at Morgans on the Danforth with an intimate candlelight beer dinner. Join us for a four course, four beer wonderfully paired meal that will be a night to remember! We’ll be turning down the lights and bringing out the candles for the event. Brewery representatives will be available to answer any questions about GLB that you may have and each pairing will be discussed between each course. 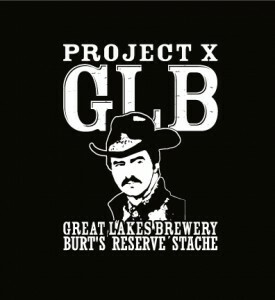 We are pleased to announce our December Project X plans! The Ugly Sweater Edition! 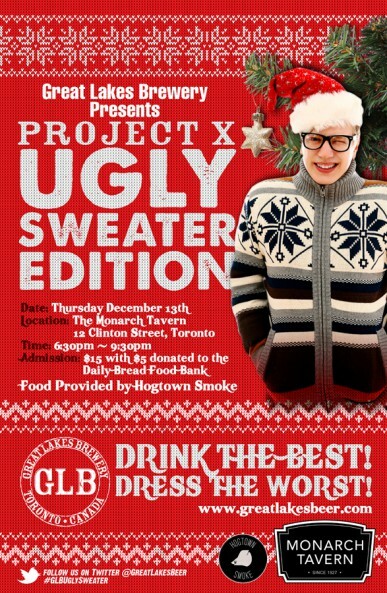 Join the Great Lakes Brewery crew for an epic night to celebrate the festive season on Thursday December 13th at The Monarch Tavern for our Ugly Christmas Sweater party! That’s right, dust off that sweater your Aunt gave you that one Christmas, or raid your Grandmothers closet and come decked out in your ugliest Christmas sweater/vest to win prizes and walk the runway! Yeah, runway. There will be a panel of judges picking out the best….errr, worst dressed person. Here’s the deal – it’s $15 at the door, with $5 of that donated to the Daily Bread Food Bank. Hogtown Smoke will be on-site offering up pulled pork poutine!! Stay tuned for more information about which beers we’ll be offering up for the event! But you can be sure to find our seasonal Winter Ale, and our latest Tank10 series beer – Karma Citra IPA. Based upon a post by Stephen Beaumont about who was his pick for brewery of the year in Ontario, this resulted in a poll right in our own Bar Towel Forums, which has led to further commentary by Troy Burtch on his Great Canadian Beer Blog. Give a read and be sure to join in the conversation at the forums. 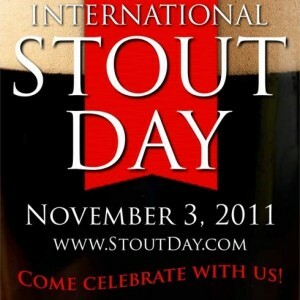 Following on the heals of the controversial IPA day (August 4th, 2011), we now have an International Stout Day. No it’s not St. Patrick’s Day, it’s actually November 3rd, 2011. Some of the brewpubs in BC offer a fine stout, but if you’re looking for a locally-produced, widely-distributed stout, your options are a fairly slim. Although both excellent, there’s only the Nelson Blackheart and R&B Darkstar Oatmeal stouts. The seasonal Maple Stout from Cannery Brewing is also currently available in BC Liquor Stores, as well as the LCBO. But BC does get a few other world-class stouts. There’s the St. Ambroise Oatmeal Stout, which was the only brew to receive a perfect 4 stars from Stephen Beaumont in “The Great Canadian Beer Guide”. 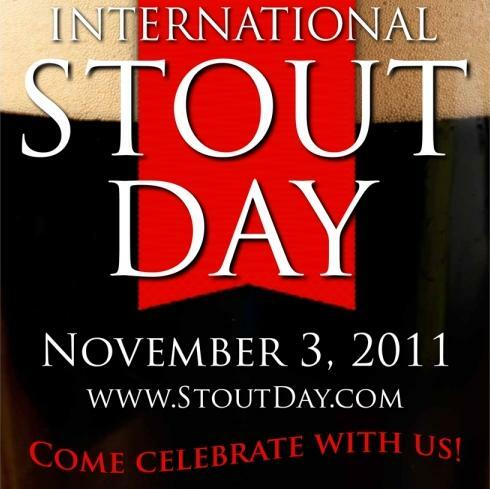 If your feeling a little more International on this day, BC gets Young’s Double Chocolate Stout, and there seems to be a few Brooklyn Black Chocolate and North Coast Old Rasputin stouts kicking around as well. Then again, if you’re REALLY LUCKY you might just have a Driftwood Singularity or Howe Sound Megadestroyer tucked away in your cellar. Are there any plans for February 2nd, 2012? I propose International Barley Wine Day! We’ve got a lot of great beers in the province, ranging from domestically produced brews to specialty imports. But they are pretty much exclusively available in bottle or can form (except for Ontario craft beers, that is). You’ll be hard pressed to find the bottled craft beer you love from the United States or elsewhere available on draught, for a number of reasons due to how kegs are handled by our provincial liquor authorities. The Bar Towel even hosted a well-publicised trip to Buffalo so we could try some of these elusive beers on draught. But there’s some good news here. If you want to go to the U.S. and get yourself a keg, you can bring it back with you and serve it at home. Now how badass would it be to host a party with Stone or Southern Tier on tap? You can do it yourself – which is pretty awesome as you’ll probably never see it at a bar, at least for the foreseeable future. You can have a totally unique beer experience in Ontario at your home with rare beers on draught and here’s how. First things first. 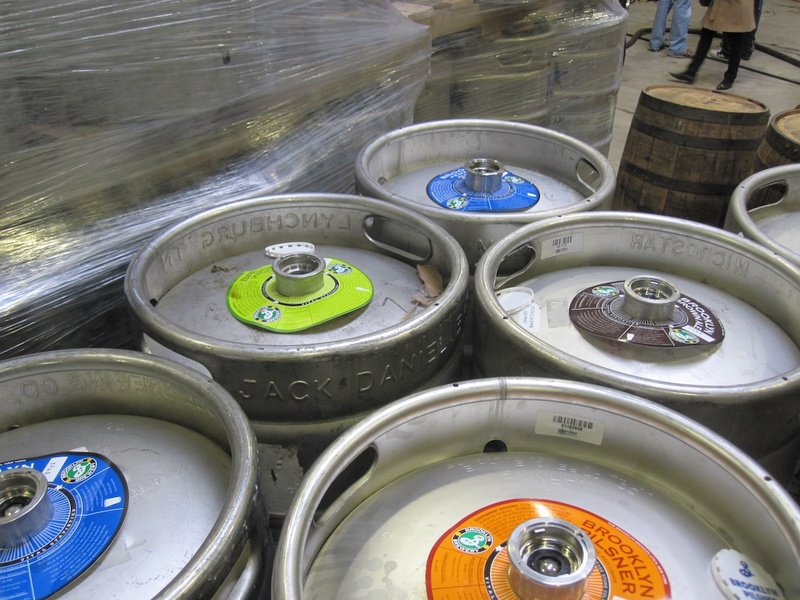 There might be some misperceptions that you can’t bring kegs back over the border. This is untrue. As I confirmed with the LCBO, it doesn’t matter what container beer is in when you import it for personal use. However, you might encounter border services officers who think otherwise, but you can explain that for personal consumption it doesn’t matter if you’re bringing in bottles or a keg. This is obviously not the case for commercial importing. Next, you need to know how much you can bring back with you, as kegs are obviously a large volume of alcohol. Here’s where you need to keep in mind some simple numbers. If you stay in the U.S. for 48 hours or more, you are entitled to bring back 8.5 litres of beer duty-free. Here’s where some people might get confused. This limit is only what is duty-free (i.e. pay no taxes). But in Ontario, you can bring in up to 45 litres more, if you’re willing to pay the duties and taxes. So if you’re in the States for 48 hours, you can bring back up to 53.5 litres (including the duty-free portion) or 45 litres if you haven’t been for 48 hours. But since most kegs are 30 litres, you’re in the clear either way. When you get to the border with your keg(s), always declare. It’s not worth the risk to smuggle. Be prepared to explain what you have, as the border services agent will likely not have encountered too many folks doing what you’re doing. They might ask you to tell them how much you have in case equivalents (30 litre keg = approximately 3.5 cases). But you’re likely going to have to pay duty as you have a significant amount (a 30 litre keg would be multiple times over your duty-free limit). If you get waved through, awesome. On to the duty and taxes. Presently it’s actually pretty simple what you will pay. There’s three components: Duty, HST and a Provincial Mark-Up. Most of the time your beer will be classified with the code “2203.00.00.31“, which is beer that exceeds 2.5% alcohol but less than 11.9%. For this, there will be a Duty charge of $31.22 per hectolitre (or $0.3122 per litre). This will be charged on the quantity of beer, not the value. Now this is the default duty, for breweries that produce 75,000 hectolitres or more annually. According to the LCBO, if you’re bringing back beer from a brewery that produces less (and you can prove it), they will qualify for a lesser duty. But it’s up to you if you want to do that research for the duty difference. And depending on if you’ve been in the States for more than 48 hours, the duty could be calculated on just the duty-free difference (in other words, duty charged on 21.5 litres only on a 30 litre keg (30 minus 8.5). Next up is HST. Pretty simple in Ontario, it’s 13% of the Canadian dollar value (not the U.S. price). This is a boon to us when our dollar is high as the value is equivalent or less in Canadian dollars and therefore we pay less tax. This amount is calculated on the value plus the Duty addition from above. Now here’s where the math starts to get possibly a bit more complex – if you’ve been in the States for 48 hours and you have a 30 litre keg, you can reduce the value by 8.5 litres which is your duty-free allowance. But you’ll need to bring a calculator to figure that out. It could save you a couple bucks if you want. Lastly there’s the Provincial Mark-Up. In Ontario, this is 67.6 cents per litre on the total quantity you have. Again, this could be calculated on just the duty-free difference if you’ve been in the States for more than 48 hours. That’s basically it. Add up those three components and that’s what you’ll pay. In my experience the duty and taxes generally work out to 30-40% of the price. I just brought back three kegs valued at about $140 CDN each (30 litres) and the taxes and duty was $47 each, or about 33%. For something totally unique, I think it’s a fair premium. A couple other notes: make sure to keep your receipts so you can show the border services agents and be sure to include bottles or any other alcohol in your totals. And think about the breweries – if you get custom kegs you probably paid a deposit that is less than what they paid for the keg itself. They would probably appreciate them back if possible. And just a caveat: the information in this post is current as of right now, with the facts that I’ve been able to research, for importing into Ontario only. There is very little specifically about beer importation online, so it may change at any moment. Oh, and you can only legally consume the beer privately – it can not be sold or served at a bar. You’ll probably want to do some research before you go to the U.S. to find the keg(s) you’re looking for. Since it’s a lot of private retail, you should contact either the brewery or distributor of what you’re looking for, or retailers to see if they can get what you want. It’s a real treat to have a keg at home of great U.S. beer, so enjoy! The CAMpaign for Real Ale is now 40 years old. Some people might think this organization is just a bunch of bearded old curmudgeon’s, but that certainly isn’t the case. Take a look at CAMRA Vancouver’s executive, it’s mostly women! There’s a whole new generation of people that refuse to consume mass-market industrial products, that seek out all-natural alternatives, and truly enjoy the flavours and diversity that only craft brewers provide. * to encourage the responsible enjoyment of beer and actively support laws and regulations that contribute to that objective. Brewed Awakening column from this past weekend. And raise a glass (of real ale) to their unwavering dedication. Hot on the heels of Toronto Beer Week’s Homebrew Contest comes an event hosted by the Southern Ontario Brewers and the Amsterdam Brewery, where attendees can learn how to make their own beer from the pros (well, the homebrew pros, at least). The SOBs make up Ontario’s largest homebrew club and this is the second ‘Learn 2 Brew Day’ they’ve held at Amsterdam. Last year’s edition was a roaring success and this year’s promises more of the same, and The Bar Towel encourages anyone with an interest in learning how to make homebrew or a desire to improve their technique to head on down to the Amsterdam Brewery this Saturday. Want to see how to make your own beer? Toronto’s largest homebrewing club can show you how! 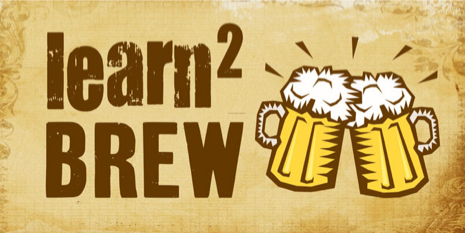 Learn 2 Brew Day occurs on the first Saturday in November, when new, and not so new homebrewers around the world are encouraged to learn how to brew or teach someone how to brew. We’ll have onsite homebrewing demonstrations by over twenty different brewers, each with their own unique style and approach. Learn how to brew, to build a setup to match your needs, and budget! This also shows a continued commitment to the homebrew scene from Amsterdam, who also agreed to make the winning entry of the TBW Homebrew Contest, which was a delicious smoked porter made by Bar Towel member Kyle Teichert. We’ll keep you updated on the release date and details of this tasty brew, but in the meantime thanks to brewmaster Jamie and the whole Amsterdam crew for supporting Ontario’s amateur brewers!